dishes were first conceived between the Mississippi River and the Alabama state line. Mississippi is a true inspiration to foodies everywhere. Our many unique restaurants offer delicious cuisine for a lazy lunch or a night on the town. Several celebrity chefs call Mississippi home as well, among them "Iron Chef" Cat Cora, James Beard, and columnist and restaurateur Robert St. John. Pull up a chair, grab a glass of sweet tea and discover the taste of Mississippi today. Fill in the form below and we'll send you an email with all our current deals for Mississippi. Experience the Rich Heritage and Fabulous Cuisine of the Delta! Several times each month, we give you a chance to learn cooking secrets from some of the best chefs in North Mississippi. Learn Old-world techniques and brand new approaches to the art of cooking in our gourmet kitchen. Just be sure to sign up early. These events fill up quickly! This course is the appropriate starting point for the beginning cook who would like extra help and guidance in the kitchen. You'll become familiar with recipe terms, cooking methods, basic knife skills, and proper seasoning, while learning how to prepare a simple meal. 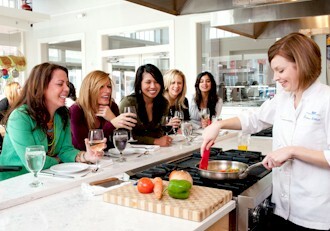 Cooking classes are scheduled by appointment for groups of six or more. Classes typically begin at 11 a.m., and we prepare a four-course menu, with lunch being served around 2 p.m. Many of Regina’s recipes are inspired by Southern classics, but are given a contemporary edge. Join us at Ro’Chez for instructor-led training by our renowned Chef Roache’ as you learn elements of food preparation and exhibition “first-hand.” The classes cost $50 per person, and will begin promptly at 6:30 p.m. on the second Tuesday of each month. The Mississippi Showcase Kitchen, our new display kitchen is now open. Learn the secrets of fine cuisine by joining us for our cooking classes. Enjoy the companionship of your friends in the most elegant surroundings and unsurpassed view in Jackson, Mississippi. The Kitchen Table offers fun and educational cooking classes and demonstrations each month. Our chef instructors provide an interactive learning experience that will allow you to reproduce each dish at home in your own kitchen. Tu Country Catering prepares every dish with love and care according to your specifications, needs, and desires, to ensure our customers enjoy the best dining experience possible. Casual, elegant, fun, or posh food - made from fresh, natural, local ingredients picked fresh that day just for you. Cooking Class Parties available. Attractions include a pageant, mooing & butter churning contests, arts & crafts, entertainment, and fireworks. Featuring vendors, blueberry recipes, free vanilla ice-cream topped with blueberries and strawberries, entertaining cooking sessions and more. The event has been proclaimed by the governor of Mississippi, as a State Championship and sanctioned by KCBS. Our music is hot, our food is soulful and our beer is of the finest craft. Enjoy music, fun, arts and crafts, and all the free watermelon you care to eat.